We’ve been saving seed from our darkest flowered babies. Its taken us years but we think we’ve got a good mix. Deep purple to dark magenta bells on moderately sized plants. EVERGREEN leaves are gray green and erect. Full sun and rich, well drained soil with ample water in summer. Blooms May-July. To 3′-4′ and then taller in bloom. Little competition from other plants- kind of a diva that way. AKA Angel’s Fishing Rod or Wandflower. 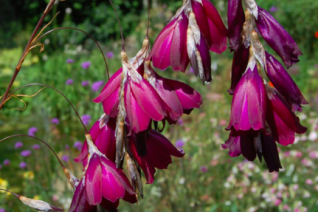 Dierama is native to open high plains in South Africa as well as in mountains. 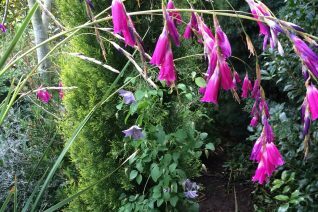 Never cut back a Dierama to the ground. It will shock it horribly and may not recover. Instead cut out old or winter damaged leaves and leave the fresh foliage. Highly deer resistant. Regular summer water through bloom then light. Spectacular perennial. A fantastic Angel’s Fishing Rod that includes great cold hardiness and enormous 8′ wands that support hot magenta tubular flowers in early summer. Gray/blue foliage is evergreen and in this form is seldom disfigured by winter cold. Clump forming with leaves to 3′ tall and spreading slowly in rich, deep soil with regular summer water. Full, all day sun with little competition from other plants. The incredibly graceful wands arch over and dip and sway with the slightest breeze. We do this variety by division so it is not in great supply but if you’ve had Dieramas fail from cold or another reason this is the one you should grow. Do not cut back the foliage in autumn, rather cut out old and damaged leaves individually to tidy. Resents disturbance once established. By far the easiest and hardiest Angel’s Fishing Rod that we’ve grown. This is done by division so availability is limited.